If you upload a PDF file to Google Docs and share it with other people, they can download it, print it and copy the file to their accounts. 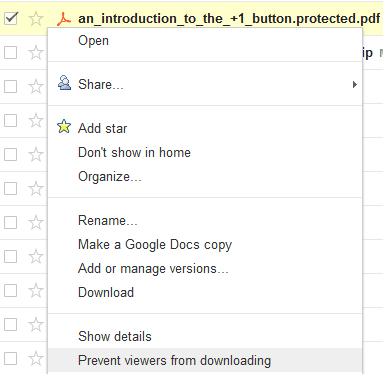 Now you can prevent other people from downloading the file from the Google Docs homepage: just right-click the file and select "Prevent viewers from downloading". For videos, this option is also available in the File menu, where you can uncheck "Viewers can download this file". While Google removes the download buttons and menu items from the user interface, there may be other ways to download the files. Only wish is if spreadsheets would work, too. I found that I can still copy the text, save it as picture or copy it as file. Hope you can fix it completely soon. I tried this but the option "Prevent viewers from downloading" is not available in the right-click menu. What could have caused this? BTW, I am the owner of the pdf file that I am trying to prevent downloading. Yes, I have files that I want people to be able to view, but I do not want them to be able to download them in anyway. This is useless if they can right click the file and do a save as and save it to their local disk. Can users still print even if blocked from downloading? To the person who tried this but the option "Prevent viewers from downloading" is not available in the right-click menu. What could have caused this? The right click menu has more options in newer browsers but not older browsers. I am using Internet Explorer 9 on Windows 7 and the option is not viewable either. It's still available, but only for non-converted PDFs. If you see the Acrobat logo, the menu option is there. If you let Google convert the document, then it's not shown.